I remember very vividly, an instance when, many years ago, I was walking through a busy mall with my husband. We were newlyweds and having kids was not yet on our radar. As we walked hand in hand through the crowds, we came across a frazzled mom who was juggling a screaming toddler in one hand and pushing a stroller full of shopping bags with the other. I commented to my husband how ridiculous it was to me that a mom would carry her child and use the stroller for bags. "The kids ages in the stroller, lady! Gees!" I commented (or something like that) and, then, I vowed that, when I was a mom, I would NEVER do something so absurd. Fast forward a few years. I had my first daughter and frequently met a friend who was also a new mom at that exact same mall. We would shop, grab lunch, and just spend time walking around with our young daughters in their strollers and shopping bags in our hands. Until, the kids and a meltdown or got restless. Then, I did exactly the thing I had years before declared I would NEVER do. I would hike my daughter up onto my hip, drop the bags into the stroller, and quite ungracefully, make my way out of that mall with the memory of that "other mother" on my mind and the distinct taste of crow in my mouth. I realize now that parenting changes your perspectives in many, many ways. With no shame or remorse - okay, maybe a little - I will whole heartedly admit that in my 13+ years of parenting, I have actually done quite a few things that, before kids, I swore I would never do when I became a mom. Co-sleeping. You buy a crib for your baby, so for Heaven's sake, put them in it! That's what "before kids" me would have said, but "before kids me" never spent the whole night awake with a screaming 7 month old who had her first ear infection (only her mom didn't know she had an ear infection until they went to the doctor the next day). At 3:00am when I was exasperated, exhausted, and needed to pee, I put the baby in the bed with my husband for "just a sec" and that baby fell asleep in about 10 seconds flat. Then, when the baby started crying the next night I thought, "Hey! Last night she slept when she was in the bed with us!" and pretty soon that sweet baby got quite comfortable sleeping in the bed with her Mommy and Daddy. I even did it again with my second child although, again, I swore I wouldn't. Using Bribery. HaHa, right??? I used to see that mom offering her toddler a lollipop if he would just behave while she made a quick trip through the grocery store and thought it was pathetic that a parent couldn't control her on kid without bribing him/her. I cannot even tell you how many times I have offered my kids some sort of treat in exchange for good behavior or a few minutes of peace. I choose to think of it as "reading good behavior" now! Feeding my kids crap. Now, when I had little ones, making your own organic baby food wasn't nearly as trendy as it is now and I had no problem giving my babies a jar of Gerber baby food. However, I tried really hard not to give them too much junk like potato chips, French fries, and fast food. You know what happened? Life happened. Busy schedules made the drive thru at McDonald's or the Dominos delivery guy the most viable option for dinner sometimes. You know what else happened? My kids decided to be picky eaters. My youngest would eat pretty much nothing if it weren't for pizza, tacos, macaroni and cheese, chicken fingers, and hot dogs. At some point, I decided that eating something was better than eating nothing. Letting them have too much screen time. My kids (at least two of the three) are perfectly happy to come home from school and spend the afternoon on the couch in front of the TV and the truth is that, sometimes, I let them. I make sure homework is done and we eat dinner together at the table, but otherwise I just let them "veg out." Sure, I can suggest they go outside or play a game together, but that usually creates bickering or the sound of "Mom! Come here!" and, once in a while, we all just need a break from it - we need a break from being busy and we need a break from each other. So, they are couch potatoes and I'm perfectly fine with that. Drink Coffee. And wine. It wasn't that I had anything against coffee or wine, I just honestly didn't like the taste of either back when I was a non-mom. Somewhere after our third daughter was born, I began to enjoy coffee, albeit doctored up with cream and sugar. I've also discovered that a sweet glass of moscato every once in a while can be quite relaxing. Put my kids in private school. I was raised in public school. My parents were public high school teachers for over 60 years combined. My brother teaches public school. My mother in law and countless other relatives taught public school. I, myself, taught public school before I had kids. I have always been an advocate for public schools. Sometimes, though, you have to take actions you never anticipated and, for me, that meant moving two of my kids to a private school this year. Parenting has taught me many, many lessons. One of those lessons is that I shouldn't be so quick to judge others. When I formed my opinion of that mother and her actions many years ago, I had no idea what it was like to be a mom. Even now that I am a mom, I realize that I don't always know what struggles other parents might be facing or what challenges I might face myself in the future. I have learned that I should probably never say "Never!" unless I am fully prepared to eventually eat my words! I had an easy first child and thought all other parents were doing it wrong - it took a second "full on" child to make me realize that you do what you have to do sometimes to get through the day! Parenting, like many other things in life, doesn't come with a road map. And in a constantly changing world, parents have to adapt to their children's needs, personalities and their own circumstances. No need for shame at all! Hugs! Yes! There are so many things I didn't think I'd do, or didn't want to be "that mom" but reality has different plans. LOL. I don't have kids, so I sometimes say these things to my husband too. Then again, one of the reasons I don't have kids is I wouldn't be able to parent them responsibly. I remember seeing kids above baby/toddler age in strollers and thinking it looked awful! And of course, we went to the fair last week and I totally let my SIX-year-old sit in Des' stroller. Not for long, but still. I also said I'd never buy anything Disney Princess (very famous last words) and my kids would eat all organic. Yep! I have learned not to judge others or myself! Definitely no road map or instructions manual - but that sure would be nice! Reality has a way of altering our plans whether we like it or not! I think we all - kids or not - sometimes have things we think we would never do and then through life circumstances we end up doing them anyway. Yeah - I wasn't going to do the pink girl stuff and then I got three daughters! Karma is a funny thing! Yep yep yep... 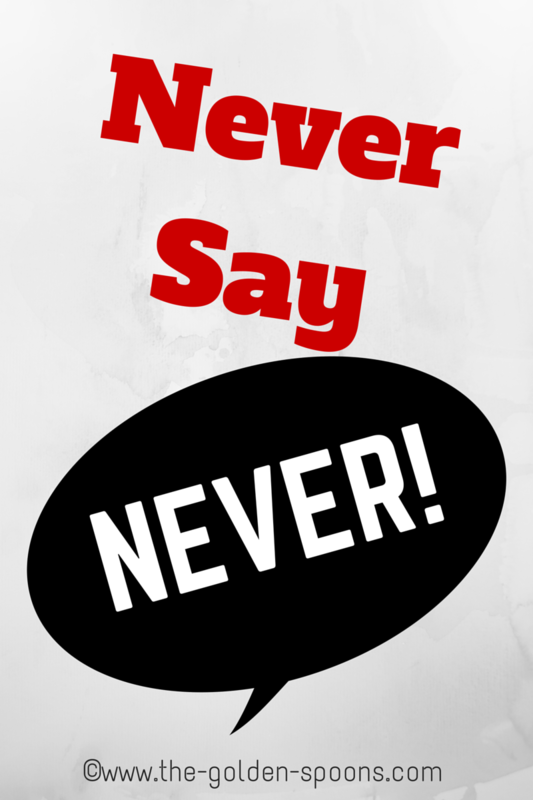 There are SO many examples of my "never say never" in parenting for me too! You named some good ones!! I especially remember teaching and having some SAHM's driving their kids to school wearing their pjs and thinking "Wow. I will never do that... why do they look so frazzled? " I learned the same lessons. I only had one, but she slept in bed with me; she has lots of screen time; and she wore pj sweats to school in kindergarten. Oh well, I never said I would do those things though. I just did them and gave myself lots of grace. We need to do that for all moms.